A letter recently came in the mail from a dear friend's little boy. His class project was to practice writing a letter...with the hopes the recipient would send something back. As somebody who teaches formal writing to university students, I have to say I was impressed with his little letter: opening/closing statements, structure (first, finally), and a clear call to action -everything was there! Better than some of my university students...ahem. 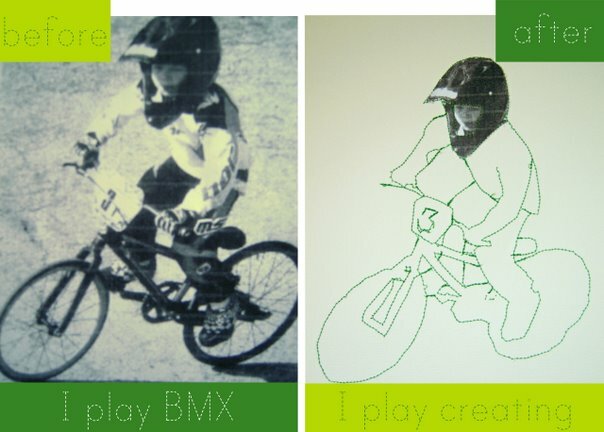 He says, "First of all I play BmX" and included some pictures of him riding his bike. He asks what I do, so I think an appropriate response is "I play creating" -though how grammatically correct that is remains to be seen, ha! I decided I would send something his way and thought I would share it here as well. 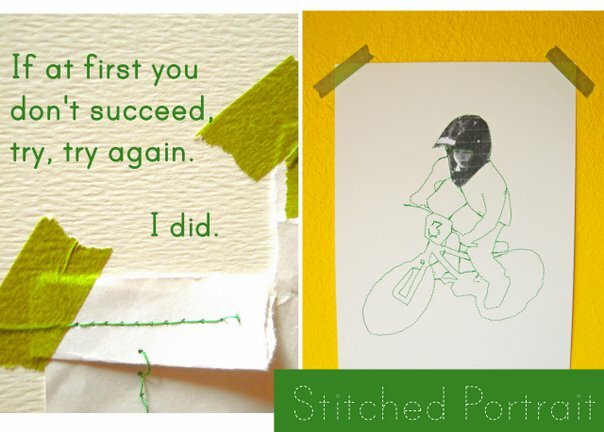 I'd seen stitched portraits in Sania Pell's Homemade Home and have been wanting to try one out for some time now. I totally wrecked the first attempt, mainly because I thought I would adapt the book's instructions and use the feed dog cover on my sewing machine. Dumb. I thought this would make it go smoother, but it totally messed up my tension. 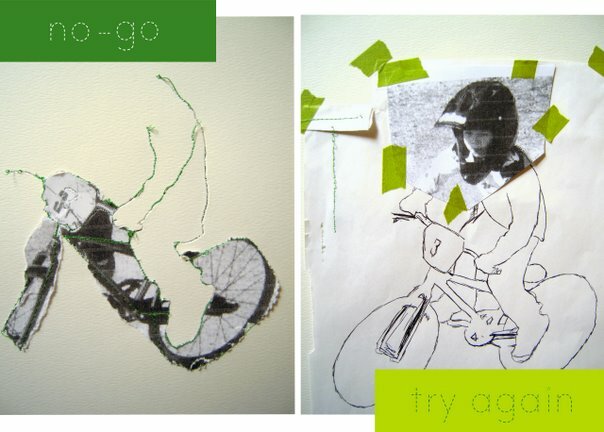 I stubbornly pressed on, determined to overcome...but I lost that battle and had to re-do it. Thankfully I had traced the photocopy enlargement of the original photo, so I had something to work with. 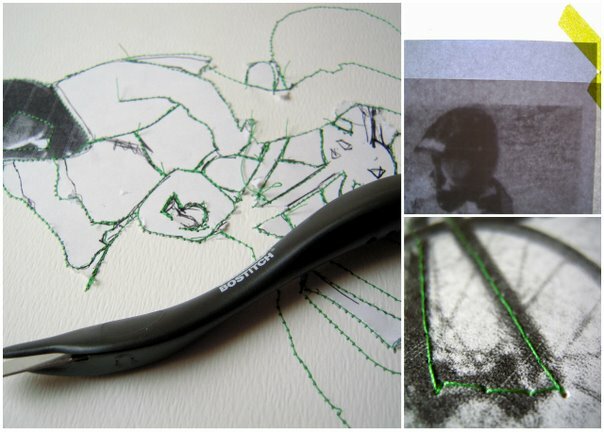 I discovered faces were trickier than I thought, so I salvaged a bit of the photocopy to incorporate into the final project. This little guy wears a lot of green when he races and he's also pretty fast, continually ranking high in his age group. 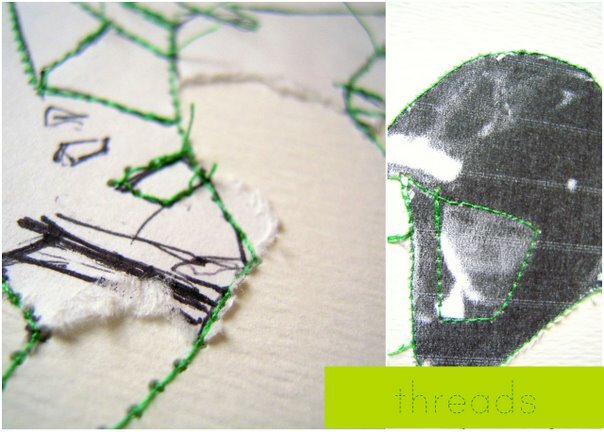 He's often called 'The Green Hornet', fittingly, so it was only right to use green thread for this project. I hope he's as pleased with this project as I was with his! I play creating. What do you play? So great Jules!!! He will LOVE IT. I play packing right now :). I'd rather play creating. So is this another buddy pinky-handshake thing with mixed media projects? O.K. So, my next blog post will be about... did you pick up on the waves? I am IMpressed. Nice job!! Hi Juliette! This is darling!! Great idea and such a special keepsake. Hope you are well – crazy busy here. Awww, such a sweet story (and little boy)! I love what you did with the picture, and I'm sure he does too.